A fun introduction to the wonderful world of gymnastics! Our camps are designed for both boys and girls age 6-11. They are a great introduction to gymnastics or an awesome opportunity to continue working the sport you love while making new friends. Camp activities include, games, open gyms, and plenty of gym time with our dynamic staff! We offer gymnastics day camps! 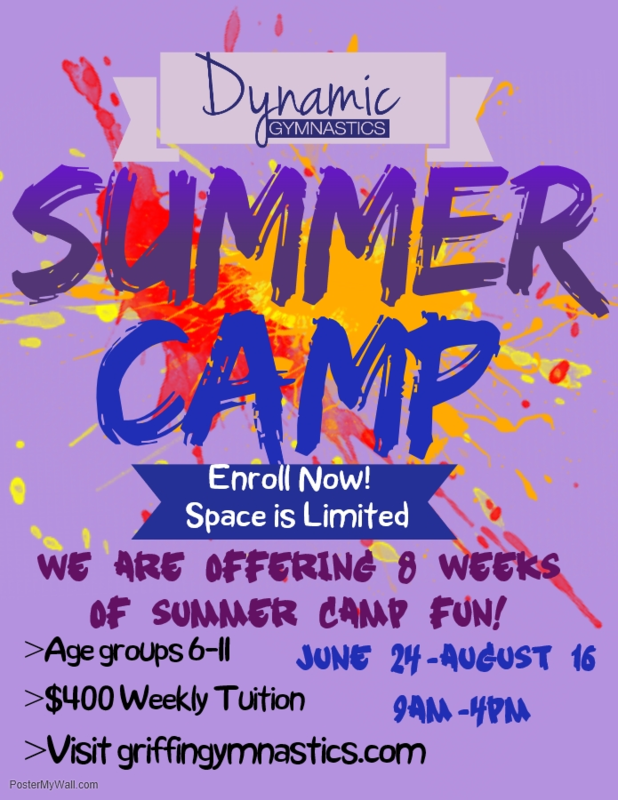 Now enrolling for 8 great weeks of fun for our 2019 Summer Camp! Register below. *We are a nut free facility. **Please leave all electronics at home. Dynamic Gymnastics is not responsible for lost or stolen items. What skills will my child be working on? Campers will be able to learn, practice, and improve beginner to novice level skills on all events based on their current level and ability. Please make sure you print and fill out the consent form before dropping your camper off. Consent forms will be e-mailed before the camp date and will also be available at the front desk. Additionally, please label all personal belongings such as lunch boxes, water bottles, backpacks, etc. Unfortunately, due to our very busy schedules, we can not offer early drop off or after care. If you are going to be late to pick your child up, please contact our front desk and your child will wait with one of our dynamic staff members. What should my child wear in the gym? Leotards are always recommended for girls and boys should wear athletic type attire. Please make sure hair is pulled back and no jewelry or activity trackers are allowed. Campers should wear clothes that do not include zippers, buttons, snaps, jeans, skirts or baggy clothing. Written notice of cancellation is required 14 days prior to the start of camp. No refund will be made for campers who withdraw at any time after the 14 day cancellation period.